Otters are listed as Near threatened on the global IUCN Red List of threatened species. Within the UK They are protected under the Wildlife and Countryside Act, 1981. A priority species under the UK post 2010 Biodiversity framework. Otters have their cubs in underground burrows called ‘holts’ and they are excellent swimmers from a young age with the cubs being in the water from 10 weeks of age. Otters require clean rivers and abundance of food and a lot of vegetation to hide their holts. They feed mainly on fish particularly eels and salmonids but also water birds, amphibians and crustaceans. Otters are well suited to a life on the water as they have webbed feet, dense fur to keep them warm, and can close their ears and nose when underwater. 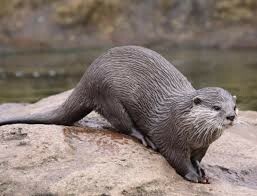 Otters are large powerful mammals with grey-brown fur a broad snout, a white chest and throat. This white marking is different for each of them and as a result is an easy way to identify each individual in the wild. Otters can be mistaken for mink but can be distinguished by there much larger and broader face. Seeing the signs of otters is far easier than seeing the animals themselves. Along riverbanks and waterways, look for five-toed footprints (about 6-7cm long) and droppings or ‘spraints’. Otters leave spraints in prominent places, such as fallen trees, weirs and bridges, as ‘scented messages’, helping them to find mates and defend territories. Have you spotted otters in your local river? We want to hear from you! If you have, then send your photos or stories to us at riverlife@forthriverstrust.org.